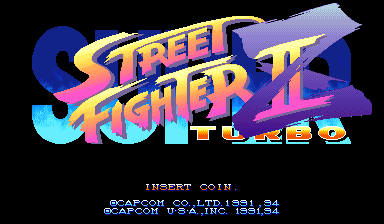 Super Street Fighter II Turbo was another tweak/release/whatever of Street Fighter II, and was pretty much the definitive version of the game (at the time). This entry in the series marks the first appearance of the popular hidden Ryu head swap character, Akuma (Gouki in Japan). It was also the first fighting game to use Super Combos. Plenty of unused frames for Ryu and Akuma that were either changed or scrapped; Cammy also has an unfinished frame that has an earlier contour shading. There's an "Ultimate Championship" prototype? 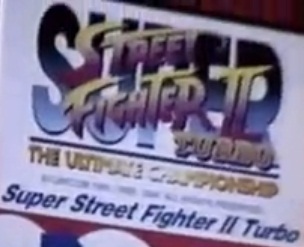 The Sound Test; some are unused, others are leftovers from Super Street Fighter II. Three unused stages, two of which are Bonus Stages from the previous version. A leftover developer mugshot from CPS1 Street Fighter games somewhere inside the ROM. Plenty more stuff related to "The League Battle". An unused subtitle and a "Z" intended for the main logo are present in the data. The Ultimate Championship subtitle was seen in an early promo (below), while the Z may be an earlier English title (before The Ultimate Championship) or an earlier title for the Japanese version. This mockup title screen shows how the Z would've looked on top of the normal title. An alternate, simpler world map backdrop (similar to SSF2) exists unused in the graphics data. New hidden character Akuma has several unused frames of animation, some of them which would later be used in X-Men: Children of the Atom. A normal Hadouken windup like Ryu's and Ken's. In the final game he does his trademark bowlegged-stance, then goes straight to the outstretched arm pose. An extra frame intended for the beginning of his far standing hard kick. Two frames intended for the startup and recovery of his vertical jumping light and medium kicks. Frames for Ken's rolling throw. A unique electrocution sprite, with Akuma's characteristic topknot. In the final game, he borrows Ryu and Ken's. This likely went unused because it isn't properly indexed to fit the palette electrocuted sprites use, instead seemingly being indexed to fit Akuma's normal palette. He also has the same unused Hurricane Kick startup animation frame that Ryu and Ken have (although in Ken's case, it's more "used to be unused"). His downward-angled Zanku Hadoukens get a newly-drawn angled variant of the standard projectile impact animation... and just like the standard one, its last frame goes unused as the effect disappears before it can be displayed. Sprites for an unused variant of Cammy's Hooligan Combination exist in the raw graphics data. Here she spins on a vertical axis rather than a horizontal one. No associated tilemaps or animation data seem to exist. Along with the animations for the newly-introduced sharp and shallow-angled variants of Dhalsim's drill kick exists an animation of a horizontally-oriented version (which was made by slightly redrawing the animation of his head drill attack). The animation has no attack box assigned and has the same vulnerability boxes as the medium-angled drill kick, implying it was abandoned fairly early in the development process. 8 different styles of win icons exist unused in the graphic data. Special sprites for a full super meter effect go unused in the graphics data. The finished game simply uses the game's standard font and an electricity effect from the title screen. What it might have been intended to look like in action. Several different alternate versions of the "K.O." icon for the players' lifebars exist unused. The final game simply uses the same K.O. icon from Super Street Fighter II. They were likely intended to flash like this upon a character's life becoming low, like the one actually used in-game. 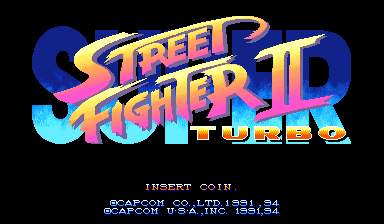 The "TURBO" in the game's title screen is actually formed from a font set, the rest of which goes unused. 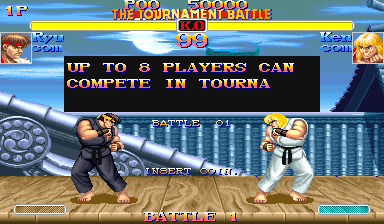 The previous entry in the series had a special variant subtitled "The Tournament Battle" which allowed 4 networked cabinets to be used for 8 player tournaments. It would appear that a similar variant was planned for this game, but never realized. Many graphics seemingly intended for such a version remain unused in the game's data. A The League Battle subtitle, very similar to the one used in The Tournament Battle. A set of large ranking numbers, complete with proper suffixes (and even an alternate Japanese suffix). 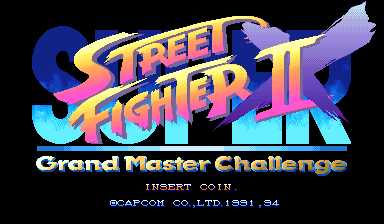 Some messages, written in the font used for TURBO text in the title screen, except that they are stored separately and have different gradient. This is a round robin tournament against X other players. You will fight X rounds against X players, a total of 9 rounds against X players. Placement is determined by winning percentage. If you win more rounds, your rank will increase. Aim for a Perfect (total X wins)! This is substantially different from the rules of the previous Tournament Battle variant, which used a 3-round single elimination style format. 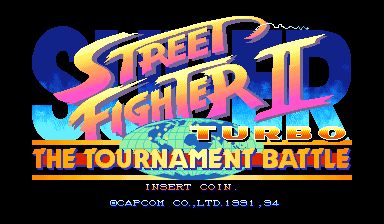 The framework of Super Street Fighter II‍ '​s Tournament Battle mode remains in Super Street Fighter II Turbo. Setting address FF8349 to a non-zero value will enable the mode. It has not been updated to incorporate the new graphics or rules that were seemingly intended for the League Battle mode. Exactly how complete this implementation remains is not known at this time, due to incomplete emulation of the CPS2's networking capabilities. A few of Akuma's animation frames have some of his hair or gi clipped off, although the tiles for them actually exist. Of the eight frames that exist within the raw graphics data for Akuma's trademark fiery aura animation, only six have tilemaps defined...and the animation data doesn't even play those in the proper order! Sound code 00D2 is a piece of music mostly likely meant for an ending. Sound code 00C1 is another piece of music most likely meant for an ending. There are three versions: USA, World, and Japan. In addition to the boss names being changed around, the character called Gouki in the Japanese version is called Akuma in the US/World versions. Some sound effects are different between Japan and USA/World versions, notably with Cammy's special moves. The computer-controlled characters are much harder outside Japan, even if the difficulty setting in the operator menu is at Very Easy. This difficulty change was not carried over in English versions of the game in Street Fighter Collection for PlayStation and Sega Saturn. The Japanese version has two different endings if you're playing as Akuma/Gouki: one if you defeat M.Bison/Vega (Dictator), the other if you defeat the secret boss Akuma/Gouki. In all other versions, all the dialogue was removed and when defeating the dictator, it just shows Akuma standing there, or when defeating Shin Akuma, it just shows the player Akuma grabbing Shin Akuma, then doing a Shoryuken. Akuma also has his own win quotes in the Japanese version, but none in the international versions. In the World version only, if Old Zangief's roundhouse suplex is performed as a reversal attack, it can throw the other character from any distance. This page was last modified on 25 March 2019, at 03:20.